The shofar of Rosh Hashana is associated with many themes and touch points in Jewish history. These include: freedom, Teshuva, inaugurating a King, Matan Torah, Moshiach, resurrection of the dead and akeidas Yitzchok. Rabbeinu Saadya Gaon identified ten distinct motifs associated with shofar. For you have heard the sound of the shofar, O my soul, the blast of war (Yirmiyahu 4, 19). In what sense does the shofar of Rosh Hashana carry an association with battle? We know that Rosh Hashana is a Yom Hadin – a day of judgment. We refer to this day as Yom Hazikaron – The Day of remembrance. But we don’t usually think of Rosh Hashana in terms of war. The Netziv (Vayikra 16: 16, 29; 23: 24) explains that Yamim Noraim is a period when the Guardian Angels of the Nations of the World approach the Ribono Shel Olam to challenge the favored status of klal Yisrael. The Netziv elaborates that this spiritual war is actually one facet of the judgment of Rosh Hashana. There is, of course, an individual judgment that exists for every single human being, Jew and non-Jew alike – kol ba’ay olam ya’avrun lefanecha kivnei maron. But aside from that there is a war which erupts in Heaven regarding the collective state of knesset Yisrael. What is the response of klal Yisrael to this celestial confrontation? How do we assert ourselves against the spiritual forces which wish us harm? The Netziv explains that our responsibility is to offer the special tefilot of malchiyot, zichronot and shofrot. Along with these we sound the shofar to reinforce ourselves for the battle. Perhaps we can better understand the relationship between the tefilos of Rosh Hashana and the nature of the “battle” by exploring the Torah’s description of the tense confrontation that preceded the miracle of kerias yam suf. With the Egyptians behind them in hot pursuit and the sea in front, it seemed as if Klal Yisrael’s very emergence as a nation was in jeopardy. Chazal note that the showdown taking place down on earth mirrored the celestial accusation of Mitzrayim’s guardian angel Uza, who declared before the Heavenly court: Ma nishtanu eilu me’eilu? Why are the Jews treated differently than their Egyptian counterparts? Weren’t bnei Yisrael also guilty of worshiping avoda zara in Egypt? Why are they worthy of being saved? 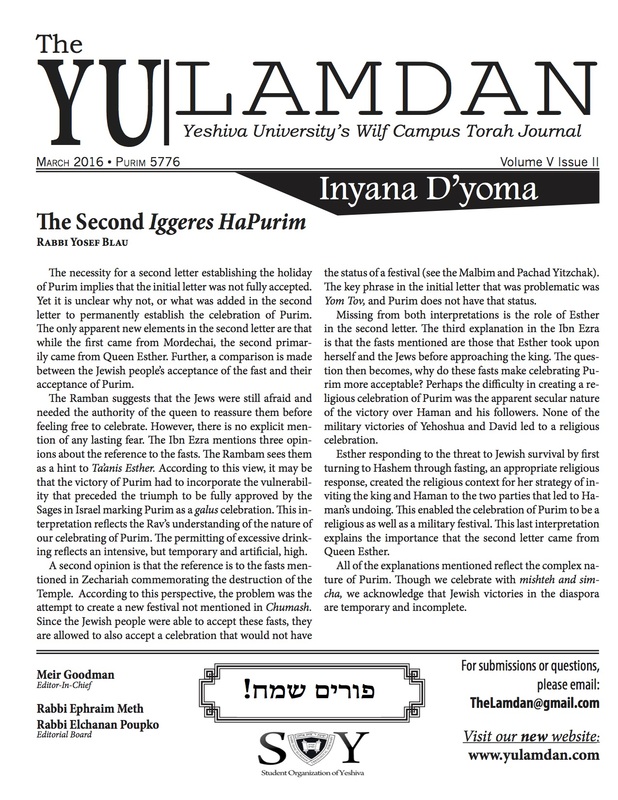 By splitting the yam suf, Hashem deflected Uza’s claim and did battle with Mitzrayim. In fact, the Torah utilizes repeated references to war in connection with this episode – “Hashem yilachem lachem, Ki Hashem nilcham lahem bemitzrayim, Hashem Ish milchama”. However, Hashem’s waging war on behalf of Bnei Yisrael was preceded by their expression of heartfelt tefila, as the pasuk states (Shemos 14:10): Vayitzaku bnei Yisrael el Hashem– And Bnei Yisrael cried out to Hashem. The Midrash (Shir HaShirim Rabba) notes that Hashem was awaiting our tefilos, as the pasuk states: “Hashmi’ini es koleich” – Let me hear your voice – your heartfelt cries. We were expected to pledge total allegiance to Hakadosh Baruch Hu, placing our complete trust in Him. Once we did that, Hashem thwarted Uza’s challenge, split the sea and drowned the Egyptians in the Yam Suf. The Chofetz Chaim often noted that everything that happens in the world at large is intended as a message for Klal Yisrael. Tumultuous historical events mirror a turbulence that is also raging in the heavens above. Often, before Rosh Hashana, we receive reminders of the sorts of battles that are raging in Heaven. Whether in the form of renewed threats from aggressive nations against Israel and the United States, simmering tensions around Israel’s borders, increased expressions of anti-Semitism worldwide, we should see these as symptomatic of parallel trends would that are playing out in the celestial spheres. Just as our heartfelt cries preceding kerias yam suf recognize the precarious predicament that we faced then, so should our prayers on Rosh Hashana acknowledge our vulnerability on the world stage as well as in the spiritual realms. Indeed, many of the tefilos of Rosh Hashana – i.e. the yehi ratzon simanim recited on Rosh Hashana night – speak about destroying our foes and adversaries – yistalku oyeveinu, yitamu soneinuetc. The shofar serves as a reminder of the ongoing battle, for which Hashem is prepared to fight on our behalf. What is expected of us is to offer the accompanying tefilos from the depths of our hearts. May Hashem continue to watch over us, and may each of us do our part to help facilitate that positive outcome of a shenaschayim veshalom, lanu ulechol Yisrael.